Hey guys! Sorry I haven't been active lately, just hit a rut and decided to take a break. But I'm back now, you can expect more posts from me regularly! :) Well, let's talk about something that everyone loves - FOOD! I've frequented Little Paris a few times to chill, but never had the chance to try the food there. Finally got the chance to drop by with a bunch of friends for a nice meal and chatter. Not forgetting, the place has such a nice atmosphere and interior, we really had a great time! Psst.. This place is totally Instagram-worthy, click to view more photos! FYI, Cafe de Flore is also one of the eateries available at Little Paris. I really like the concept of this place. The whole area is a one-stop solution to fulfil your accommodation, food, fashion, spa & beauty, hair and nails needs! Every single angle is so photo-worthy, what with the cute little huts, pretty hotel settings, colourful seating and there's even a Lady Liberty replica at the area! Here we have our main attraction of the night - Garden Ritz. 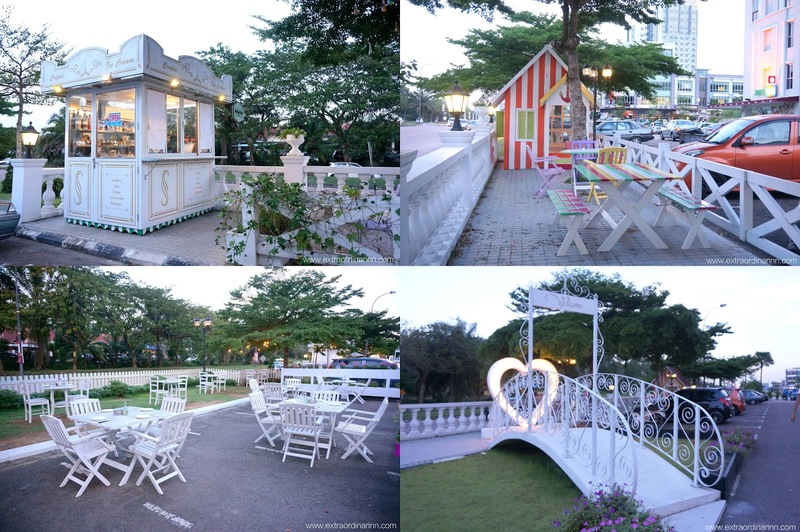 It's an outdoor-concept restaurant, something unique in Johor Bahru as there are no indoor dining areas as of yet. Don't you love the European summer-feel that the place exudes? They somehow manage to pull off a fun yet elegant touch at the same time. Yeap, that's real sand behind the bar! What sets Garden Ritz apart from the rest is that all the food is cooked with their state-of-the-art charcoal oven. The owner and chef, who practiced in Switzerland, believes that food tastes better when it's cooked with charcoal as it produces that smoky flavour, especially when it comes to meat and seafood as it is cooked quicker and gives that beautiful caramelised exterior. However, it's no secret that cooking with charcoal takes a longer time, so I'd advice diners to be prepared for the wait, it'll be worth it! Let's start off with some red wine and sparkling juice while waiting for the food. I had the Begney Noir Merlot 2013. I personally love wine and though I'm no wine connoisseur, I know that it's a great beverage to complement red meat or seafood! It's also nice to have it chilled as it can get quite hot when dining outdoors sometimes. Garden Ritz has recently launched a brand new sharing menu. Please note that the restaurant and its dishes are NON-HALAL. This is one of the new dishes that feeds 2 - 4 pax, ideally. I love Spanish paella with softer, mushier rice but this one has a bit of a bite to it which suits the locals' tastebuds more. The short grain rice used is extremely flavourful even when eaten on its own. The paella contains copious amounts of meat and seafood as you can see - 3 big chicken drumstick, fresh squid, mussels, prawn and lots of vegetables. I'll let you in on a little secret.. One of my favourite paella that I've had in Malaysia is at Estillo in KL, and I do think this is comparable to that standard. The dish has a waiting time of 45 minutes as it needs to be slowly cooked in the charcoal oven. Still, I do think it's worth the wait as you can't find many Western food places in JB that serves this dish! Now, I know you're taken aback by the price, but hey, it is a sharing platter for 4 - 6 person after all so it'll ultimately only work out to RM33 each? It's about 20 - 30% cheaper than ordering an individual main course, and you get to sample so many kinds of meat & seafood! The platter contains chicken, lamb, half rack of baby back pork ribs, pork skewer, fried calamari, tiger prawns, sausages, curly fries and a small serving of fruit to cleanse your palate. Waiting time is also 45 minutes and comes with 3 condiments - Romesco sauce (a combination of nut & red pepper, best paired with fish), ginger teriyaki sauce and tomato ketchup. Though I did not manage to taste every single item in the platter, I must say that I did enjoy the meat as it's very well-marinated, the sausage & curly fries were tasty and the seafood served was very fresh. One of the more affordable sharing dishes is this skewer bucket with chicken, beef and pork kebab with sausage, fries and grilled vegetables. The chunks of meat are cut into nice bite-size pieces, but was a bit dry so I'd recommend pairing it with the accompanying condiments. I'd say the meat and sausage here are similar to the mix platter, except in smaller quantities to suit smaller groups. This is Garden Ritz's signature dish and they claimed that they are the 2nd best in JB, just so they can always have room for improvement :p The meat is so tender that it just falls off the bone and is so flavourful, even without dipping it in the sauce. I found that the pork is also tasty when paired with pickles. The dish is unlike the pork ribs found at Naughty Nuri's, the current hot favourite in JB for pork ribs, as it's BAKED till perfection, without stripping the juices off the meat. Freshly baked salmon covered in homemade teriyaki sauce is my bane. The dish was also served with grilled potatoes and a side of salad for more texture. I give the salmon as pass, especially when you consume while it's hot, as there is no fishy taste at all. The fish is fresh and tender on the inside, while having a crispy skin on the outside. This was extremely enjoyable and one of my favourite dishes of the night! While we're on the subject of fish, let's talk about this grilled saba fish. I love to pair this with rice especially when I'm having Japanese food, but there was a tad bit of fishy smell for this dish so lots of lemon juice was needed to mask the smell. The fish was tender though, though I'd prefer the fish and salad with some sauce so it's not that dry. This is another classic dish with a signature Garden Ritz twist as this tender chicken chop was well-marinated with their very own ginger teriyaki sauce, served with a side of fries and salad with sesame dressing. They really made it their own! All pizza at Garden Ritz are charcoal-oven baked, thin crust pizza. I love thin crust pizza, leaves more space to try more food :p First off is this Tuna Teriyaki Pizza which has an unexpected spicy kick to it! We were all surprised when the spiciness and tanginess kicked in after the first bite. Sadly, the tuna was so spicy that it overpowered the teriyaki taste, but still a nice dish for me because I love spicy food! The smoked salmon pizza is topped with generous amount of thickly sliced of smoked salmon, mushroom, onion and basil. The saltiness of the smoked salmon and cheese are properly balanced out. This pizza has thick large chunks of beef, chicken, sausage and pork bacon - it's a meat lover's heaven! As you know, I can't have beef, so sorry, I can't tell you how this tastes like :p My friends did say that the meat has a sweet seasoning though! 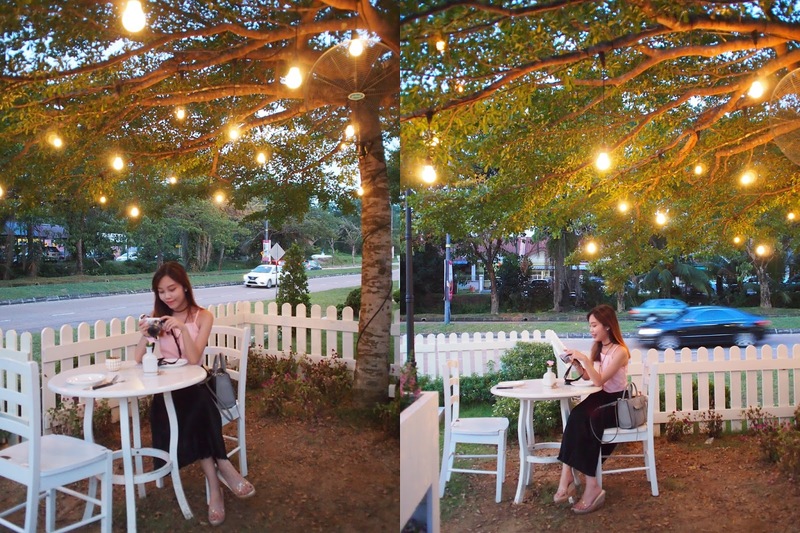 After dinner, we went to Cream Glacee for dessert, another shop that can be found at Little Paris. Love the cutesy decoration of the place with colourful flags, white brick walls and what not! With Cece, long time no see! For more information, drop by Garden Ritz's Facebook page to keep up with their latest promotions! Disclaimer: Even though the review is sponsored, it is based on my honest personal thoughts, experiences and preference after personally trying out the food and services offered. WOWW WOWOWW! omg i do love this cafe damn nice weih! aiyakk suddenly see the pork menu there hahahah cancel cnt go lorh. btw thumbs up to the owner really nice concept! Alamak! >< But it's ok, you can go and take photo! Haha. Yessss! Nice place to take photo too! Great effort... superb organic content. If you are interested in STYLISH MEHNDI DESIGNS FOR EID FESTIVAL do have a look.